I know everyone has said these thing, but I had to say them. 1. The reason Jason made Charles think he was a little girl was because his power is not telepathy like Charles, but rather creating illusions, so he had to do that to gain his trust and it didn’t last as long as you said it did, and it was a sad moment when jason made Charles think he could walk again. 2. Pyro’s turn was not out of nowhere because throughout the movie he was guy that wanted to show off his powers and Charles restrained him, and remember that pyro attacked all of those cops in the film, so when magneto offered him to join him, he took it as freedom from xavier, so he decided to join him. 3. How is having a fast moment be followed by a slow moment a bad thing? Especially when you usually complain about when a fast moment is followed by another fast moment. 4. How is making rogue more compelling a bad thing? All they did was make her more interesting, and I don’t mind it because it makes sense that she would be scared and tortured by her powers because her power is if she touches someone, they die. Also, when rogue was originally introduced, she was a timid villain looking for forgiveness. 5. The scene with iceman’s parents was there to develop iceman. 6. The only reason you complained about the jet fight, (which was awesome) was because you are used to the animated series where they fight mutants and sentinels, but that doesn’t make the action scene bad. 7. Cyclops knew that logan and Jean had a thing because in the first film that was the whole reason he didn’t like logan. 8. Iceman is not nearly powerful enough by the time of that movie to freeze the lake. 9. Mystique making out with wolverine was a reference to the comics where they had a relationship. 10. I always felt like Jean wanted to die because she was scared of the power growing inside of her and knew about the Phoenix. So when she said it was the only way, to me she was saying it was the only way to stop the Phoenix, but little did she know that water would make her become Phoenix. About Jean's (here is your joke) sacrifice. Well, yeah, that, maybe, wasn't hinted enough in movie ("judge the film by what it have here and now" and other such stuff), buuuuut... Since Jean had Dark Phoenix inside her isn't this sacrifie looks like intentional suicide? So DP just won't be released and won't do Thanos' job too early. Jean felt she and Prof. X can't hold him any more and she won't be able to help X-Men properly (we'll imagine she helped them properly)+kinda convinient place and situation for burial of someone that strong as DP. 5:32 I think Stryker knew Mystique took the body of Senator Kelly and that’s why he said that line. Because he is technically speaking 26 years older than her! This is a great movie, but too many fans talk like its the "Empire Strikes Back" of Xmen trilogy (hope I'm not strawmanning too much, that is my perception though). 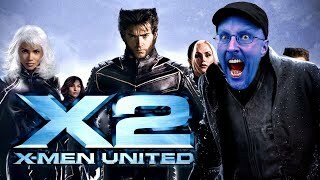 I like all of the first five xmen movied about equally with a slight preference for X1. One advantage of X2 is that most characters and relationships have already been established. X2 gets to explore and expand these arcs and conflicts, as well a start a few new ones. Great action sequences too. In no particular order: Nightcrawler vs WH security, Wolverine vs the the invasion team, Magneto breezing out of prison the instant he is in range a few ounces of metal, Pyro finally rejects school and discipline(he's clearly fed up with holding back at the start of the movie) so unleashes his flame power at the police after they shoot Wolverine in the face, and Wolverine vs Deathstrike. I fetishize blue myself as you can tell. Also, you can tell Bryan Singer is bisexual because of his closeups. Storm being awful in all of these movies, should be DIRECTLY BLAMED ON THE DIRECTORS AND WRITERS. They went on record, saying "we never really got her appeal." "I know X-Men fans hate Cyclops" Wait what??? I would actually like a Top 11 of worst educational establishments in TV and film. Sunnydale High? Xaviers school for the gifted? Yeh, I'm a party animal. Are you off on your anti depression pills or it it that time of the month? or is it both? :D This film is awesome, you just forcefully nit pick and twist things. "He could have picked up the plane from inside" Since when is Xavier telekinetic? I thought he could mess with people's heads, never throw things with his mind.